Commercial outdoor products, by their very nature, need to be durable and attractive. Their design needs to withstand the weather, as well as continuous, and sometimes heavy, use. Thermoplastic-coated steel products meet these requirements and more. Adds an additional layer of protection and beauty. Has a built-in adhesion rate, which adheres the thermoplastic to the frame and components of the product. Applied to all areas, including hard-to-reach places such as joints, undersides, and corners, as well as the entire surface area. Thermoplastic is a polymer. When heated, it turns to liquid. When cooled, it turns into a glassy state that lasts for years. Most damage is easily repaired. Spray paint will not adhere permanently and can be easily removed using WD-40. Choosing a thermoplastic-coated product ensures that it will last a number of years and through a variety of uses and abuses. Our durable thermoplastic products are available in a myriad of colors and styles to create a custom look for everyone to enjoy! Delivery time was good. Item is well constructed and priced right. 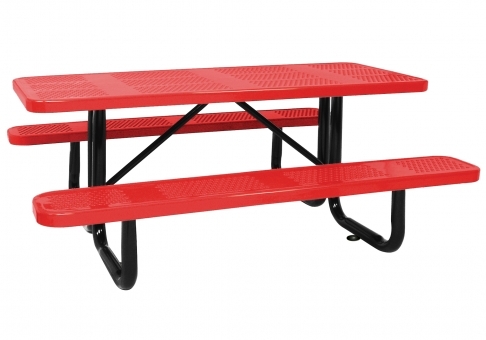 Love the picnic table, appearance and quality very good. Nice color choices, fast turn around. Very pleased with order and service.